As a brilliant Karst cave marked on almost all travel itineraries, Reed Flute Cave got its name from the verdant reeds growing outside it, with which people make flutes. Actually, inside this water-eroded cave is a spectacular world of various stalactites, stone pillars and rock formations created by carbonate deposition. Illuminated by colored lighting, the fantastic spectacle is found in many variations. Walking through the serried stone pillars, tourists feast their eyes on changing spots, feeling they are in a paradise where the Gods live. Tourists enter the cave and then take a U-shaped sightseeing route to see different spots, whereupon they exit it from another cave quite near the entrance. One trip lasts about forty minutes. It is a Chinese habit to give each formation a legendary or poetic name such as Crystal Palace, Tower-shaped Pine and other interesting names. For some of these names, you need to use your imagination, but the story behind each is quite fun. It's a pleasure to listen to romantic or fairy tales whilst appreciating the fantastic stone formations. There are two peculiar stalagmites: one is like a snowman, and because of the coldness, he put his hands into his pockets. Another is like a round tower-shaped pine, whose branches are covered with a thick layer of snow and ice. 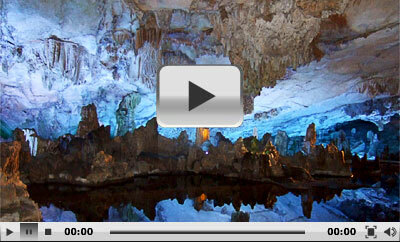 "Crystal Palace” is the widest part inside Reed Flute Cave. This is a brilliant hall and the height decreases to all sides. The stalactites are hanging up in four directions, and they are like series lanterns decorating the hall. Under the light effects, some stalagmites look like jumping fish. Leaving Crystal Palace, several narrow lanes appear in front of tourists. According to Chinese myths and legends, this is the place where Monkey King, a main character in Journey to the West, fought with numerous underlings of Dragon King to get his powerful weapon, the magic needle of fixing the sea. Despite the fantastic natural scenery inside Reed Flute Cave, there are many writings on the wall. According to some statistics, there are 77 travelogues and poems left, which are said to be derived from the Tang Dynasty (618-907), making the cave a popular tourist site at that time. The illuminated cave looks like a fairyland. Reed Flute Cave is formed by long-term water erosion and carbonate deposition. The rocks inside the cave are mainly limestone. When the underground water flows, it dissolves the calcium carbonate inside the limestone. When the water containing calcium carbonate flows out from underground or drops out from cave roof, the water evaporate, only leaving calcium carbonate. After years of accumulation, stalactites form. Till today, these stalactites inside the cave are still “growing” as the water keeps dropping or flowing. 1. Take city bus 3, 58, 13 and get off at Reed Flute Cave Station. 2. Take City Sightseeing Bus to get there. Its running route is Elephant Trunk Hill - Seven Star Park - Wave Subduing Hill - Folded Brocade Hill - Reed Flute Cave. It departs from 10:00 to15:30 with an interval of 30 minutes. 2. CNY45 for children from 1.2 meters (3.9 ft) to 1.4 meters tall (4.6 ft). What number of bus to Reed Flute Cave is the tour bus and where can i catch it? Thanks. There is no exact bus number. In Chinese, this bus line is '旅游观光一号线'. Hope helpful! Lockers available on Guilin Reed flûte cave ? Don't worry. You can put the luggage at the ticket office of the scenic area. Is it possible to go from Guilin to Yangshuo by boat as a single trip, with all our luggage? If so, where could I arrange that? Yes, foreign tourists can buy the boat ticket and board the boat at Zhujiang pier and the luggage can be allowed to be arranged on the boat. Is it ok to visit the Reed Flute Cave on a rainy day? Yes, it’s okay, and the rain affects little to the cave. I will be in Guilin on February 15th and wondered if the Reed Flute Caves are open at this time. Don’t worry! It’s still open at that time. Have a nice trip!